Should breaking a tennis racquet be allowed? I’m all for players being courteous and models of professionalism, however; there is something so primal when I see Andy Roddick, Novak Djokovic, or even Marat Safin lose their cool and smash their tennis racquets on the court. It’s as if it’s something that should go hand in hand with tennis, because it can be extremely frustrating when things aren’t going your way. 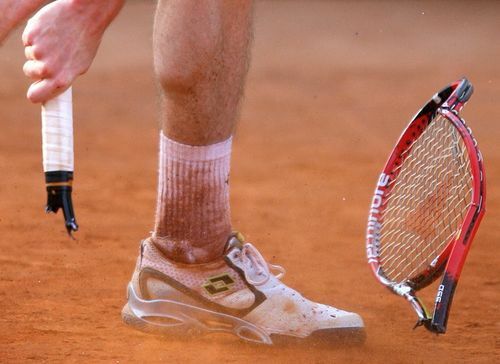 If a player actually commits this ‘crime,’ the official usually warns them about racquet abuse, the next violation will result in a point, and the next will result in the game – Andy Roddick recently committed this crime. Typically players are fined a couple of thousand dollars after the match for the violation, which I see as rather excessive for breaking a $200 tennis racquet. My real question is, should the USTA/ITF take the tennis racquet abuse rule off the books and allow the tennis players to bust their racquets? Obviously, not breaking every racquet they have all the time, but in certain situations. My opinion is that they should not be punished for doing it, I see it as a form of expression; like Billie Jean King said about tennis “Tennis is a perfect combination of violent action taking place in an atmosphere of total tranquility.” Breaking a tennis racquet out of frustration is nothing more than just breaking a tennis racquet; it’s not like you are hurting anybody and most of the time the player throws the broken racquet into the crowd or gives it to a ballkid as a cool souvenir. It’s not like any player is going to purposely throw their tennis racquet at their opponent, line person, or tournament official. They are just, after all, taking it out on something that doesn’t have feelings. I personally like to watch a player play amazing points just as much as I enjoy watching them blow a gasket, so the USTA/ITF should absolutely remove this blasphemous rule from the books and let players bust their racquets as they please. First of all, it’s absolutely hilarious that we have an 8 minute video detailing Marat Safin absolutely destroying an entire arsenal of racquets. I can’t even imagine the sheer magnitude of the amount of equipment he has brutalized over the years off camera. That guy was crazy, inconsistent, and incredibly talented. Oh and he apparently had quite a temper. Interesting note about Safin, I remember watching slam coverage and they flashed to his box. He either had the most attractive group of friends and family supporting him, or he brought a harem of ……groupies to the court. Concerning the rule: I’m all for these rabid displays of emotion; I get a kick out of them as much as anyone. Some of those launches by Safin though were looking pretty dangerous. You could see a couple of those ball boys stepping lightly around him just in those short clips. I think it’s fine as long as it doesn’t get out of hand–and that’s probably the intent behind enforcing the rule so strictly. It’s a lot easier to just disallow it completely rather than make some arbitrary standard where it goes from an innocent show of emotion to something more dangerous. I don’t really care about the sportsmanship side of it, I guess maybe that makes me a bit immature. The only cases of this where I’ve really felt it reflected poorly on a player’s image is when they are moping, pouting, and just generally dragging their feet around the court. Count me in for the “primal” and explosive outbursts though. Thanks for another great topic! Looking forward to read more of your posting! Cheers! Billie Jean King once said, “Tennis is a perfect combination of violent action taking place in an atmosphere of total tranquility.” That’s exactly what it is, violent. If all professional athletes were held accountable for their lack of sportsmanship, then the world of professional sports would be in some very serious trouble. All the time we hear about NBA, NFL, MLB, players breaking the laws of society, yet are typically given special treatment because of their status, how is that being a role model to the children that idolize them? In comparison, a broken tennis racquet is much more acceptable and less a lack of sportsmanship.